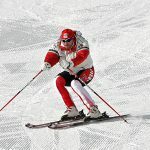 While active use of the inside ski has been a part of modern technique for more than a decade, it is still widely discussed and debated throughout ski racing community and, in my opinion, is often misunderstood. Some ski instructors and even coaches advocate «railroad truck» turns using a 50 / 50 approach to weight distribution between the skis, while others insist on a dominant role of the outside ski throughout the entire turn. Yet there are some, who teach loading the inside ski as a way of initiating a turn. In this article I would like to share my view on a subject of using the inside ski. 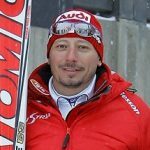 As a coach, who currently serves as a technical consultant with a number of National Teams in Europe, I feel obligated to help racers and coaches to understand this very important aspect of modern technique. I am convinced that this breakdown makes a lot of sense, especially when trying to figure out the behavior of the inside ski as it progresses through an arc of a turn. 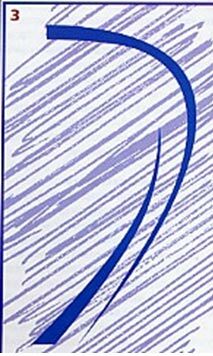 For example, having more weight on the inside ski in the beginning of phase-I is definitely not a good thing, while it is almost a must at the very completion of phase-III. The same could be said about the 50 / 50 approach that can also be very beneficial in phase-III of a shallow turn executed on a moderate pitch. In other words, in order to produce efficient movement patterns, we should not insist on just one approach to using the inside ski. We need to understand the role of the inside ski in each phase of a turn, and then, teach particular movements for each of the turn phases. So, in contrast to the ski technique of the past, an active use of the inside ski undoubtedly plays an important part in a variety of technical elements that form an efficient modern technique. In this article I will illustrate the use of the inside ski, mainly in GS turns. However, the mechanics remain the same for all disciplines of ski racing. 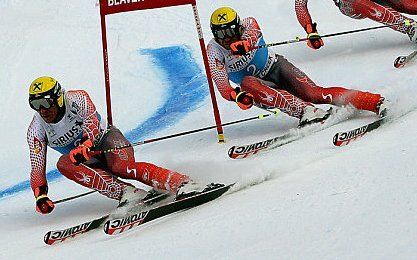 Since the technique related to use of the inside ski is often misunderstood by some instructors and coaches, we see a lot of junior racers using the inside ski incorrectly. Based on my observations, the most common mistake is the promotion of skiing with «equally loaded» skis (i.e., the 50 / 50 approach). Young racers are mistakenly being taught to carve by executing so-called «railroad tracks» while standing firmly on both skis. All of us have seen kids and even junior racers making these turns while remaining in a constant wide stance by moving the knees and shins from side to side to produce edge angles. Typically, these types of «turns» are easily executed on junior skis with a lot of side-cut and are especially easy on slalom skis. These skiers look static and often remind me of small sledges sliding down the hill. Normally, on a groomed moderate pitch these skiers draw continuous parallel and equally deep trenches similar to the ones depicted below. What is even worse is that many of them confuse these turns with modern dynamic race turns. 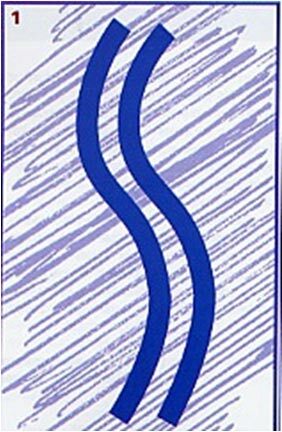 This illusion dissipates as soon as they switch to longer and straighter skis (not to mention FIS compliant GS skis), or simply move to a steeper slope. However, by then it can be too late. Racers who have developed the movement patterns of equally loading both skis throughout the entire turn can never demonstrate anything half decent in the gates. In the gates these racers typically lean onto the inside ski by the beginning of phase-II and lose pressure on the outside ski. Thus, at least a part of an arc in phase-III is executed with significant skidding. Even if the skier exhibits good overall balance, he or she has a very small chance at making a clean arc entering a turn with a 50 / 50 weight distribution between the skis. This approach might work in some shallow turns performed over a relatively flat terrain, but cannot be successful if he or she only has this one way of using inside ski in their technical arsenal. So, why are these mistakes so common among coaches and racers? 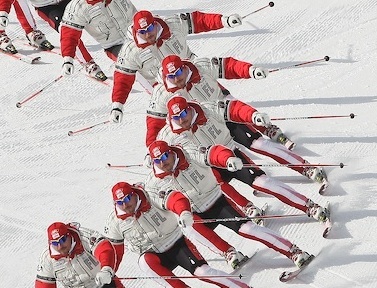 Perhaps because they copy the technique of World Cup skiers from photo shots that are typically taken right at the gate, similar to this picture of Didie Cuche of Switzerland. 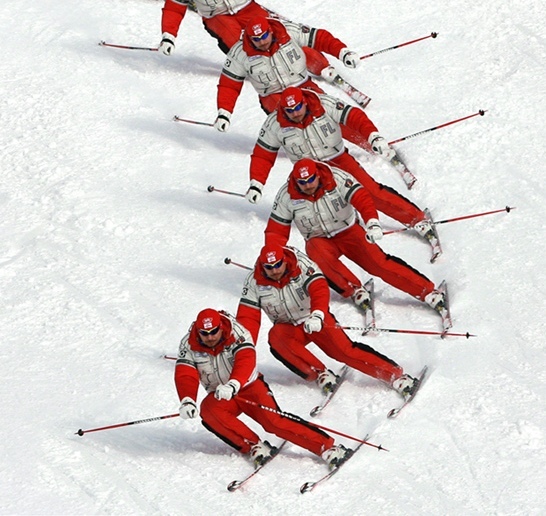 In this picture, Cuche executes phase-III of the turn with weight on both skis. 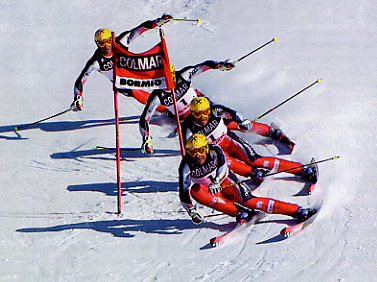 Often the inside ski is bent in this phase of a turn as demonstrated by the author in the following sequence. In the last frame (phase-III of the turn) the inside ski is obviously loaded and bent slightly. However, it is just one frame out of three. In fact, in frame three (from the bottom) the skier exits the fall line at the completion of phase-II with significantly less weight on the inside ski that is practically straight at this point. So, how do the World Cup racers use the inside ski for producing more speed out of each turn?Generally, World Cup skiers maintain the weight distribution ratio between their outside and inside skis somewhere between 80/20% and 70/30% in phase-I of a turn. This ratio changes throughout the arc of a turn. Normally, a good turn is started above the fall line with close to 90% of the weight on the outside ski as demonstrated here by the author. The turn begins in the second frame (from the top). At this point the inside ski is really light and is almost off the snow. As the skier progresses through phase-I, more weight shifts to the inside ski. 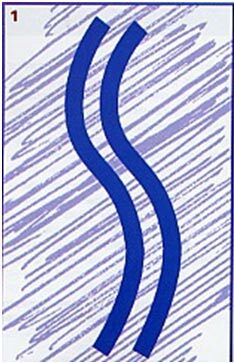 As the skis enter the fall line in phase-II, the inside ski begins to carry more load not only assisting in maintaining balance laterally, but also participating in carving an arc of the turn throughout phases-II and III, as can be seen from the following sequence. It is not uncommon for racers to transfer even more weight onto the inside ski at the completion of phase-III. Typically it is done for releasing and accelerating out of the arc by straightening the turn exit (i.e., completion of phase-III) as demonstrated here by Hermann Maier. The phases of a turn typically have different lengths. The length of each phase depends on the steepness of a hill and the shape of a turn. The steeper the slope and rounder the turn, the shorter phases-II and III have to be in order to maintain speed. In case of a long sweeping turn executed on a flat to medium pitch, the lengths of all three phases can be nearly the same. Only in this particular situation can weight distribution between the skis be maintained near 50/50 practically throughout the entire turn. 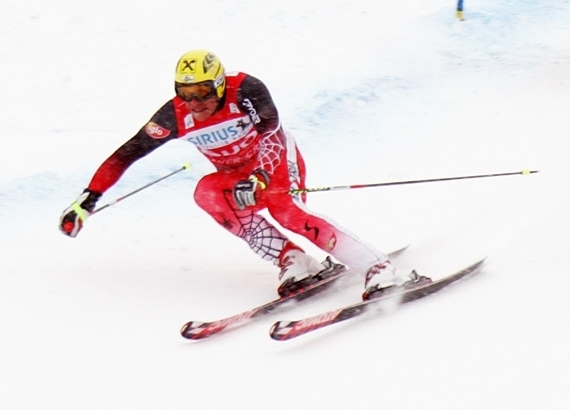 This is just a particular case of a GS or a super- G turn that is erroneously considered by some instructors and coaches to be a basic technique that dictates how the inside ski is used in all turns. As seen above in the sequence of Mayer, at the completion of phase-III, the ratio can change towards transferring even more weight onto the inside ski up to 60 % outside / 40% inside or more. It is an aspect of the modern technique that is very often misunderstood. A detailed explanation of it is provided below. I hope that the load distribution percentages provided here are not taken literally. These are just approximate hypothetical numbers. 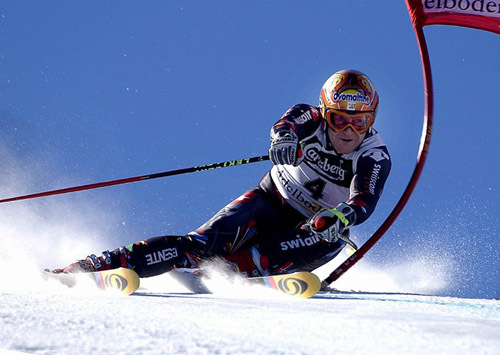 In reality, pressure shifts between the skis gradually as they advance through the arc of a turn, as demonstrated here by Rainer Schoenfelder of Austria. I believe that these very tracks should be produced by junior racers, as well, while free skiing on a moderately steep slope. In my opinion, studying the tracks left on the snow by racers can be very helpful in analyzing and refining their technique. While examining the tracks of World Cup skiers, one can notice that the track left by the inside ski gets deeper (or wider, depending on the snow) at the end of the turn right before the beginning of the next one. A closer look at the tracks can also reveal some convergence of the tracks in phase-III. Why does it happen? Perhaps an answer to this can be illustrated by a sequence of Kalle Pallander of Finland executing a GS turn on a moderately steep section of the GS course at Beaver Creek. Some proponents of equal weight distribution also insist on avoiding convergence of the skis by an «active steering» of the inside ski. While it may be done so in slow «railroad track» turns, it is hardly possible in dynamic turns at racing speeds. Furthermore, it is simply unnecessary and, in fact, can be very slow as it makes for an excessively round arc of a turn. 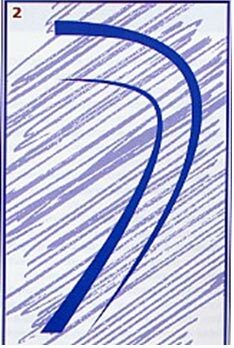 Even if a racer were to carve such arcs in a very clean fashion, he or she would always be losing speed in every turn. 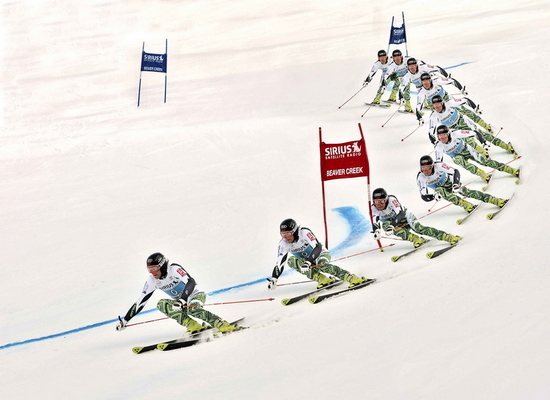 In order to maintain or even generate speed in a phase-III of a turn, World Cup skiers straighten out the turn exit. In other words, they make accelerating arcs of a pulling radius (i.e., comma shape) that allow for «releasing» out of the turn at about 45 degrees to the fall line. This is done by shifting the weight from the outside ski onto the inside one at the completion of phase-III as demonstrated here by Hermann Maier. In the third frame (from the top), racer’s outside ski is locked into a tighter arc than his inside ski that is going almost straight (i.e., carving an arc of a much longer radius). At this point, if the racer were to continue pressuring the outside ski, he would end up moving too far across the hill and slowing down. Instead, Maier shifts the weight from the outside ski onto the inside one that takes him in the desired direction (last frame). 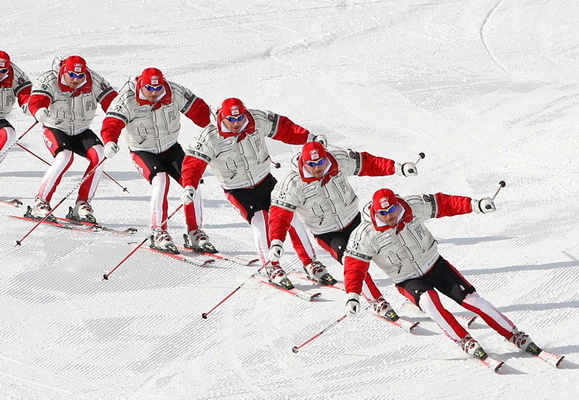 While this movement is often used by World Cup skiers, its timing can be somewhat tricky. 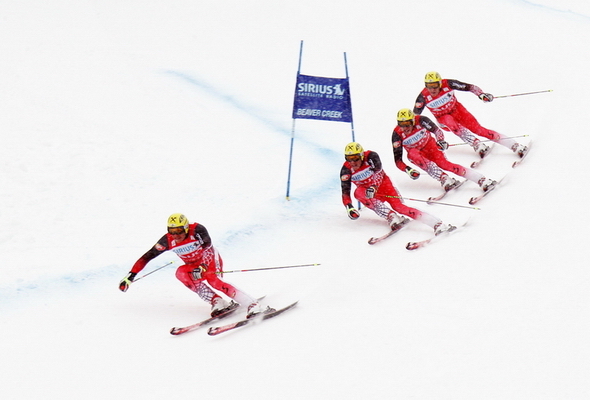 If the weight is transferred onto the inside ski too late, the racer gets too far across the fall line, which prevents him from properly attacking the next gate. However, if the inside ski is loaded a little too early, it may result in heading too straight for the next gate. In this case, a correction of line may be required which can also affect the racer’s speed. Thus, the proper timing related to loading the inside ski has to be mastered in a free skiing first. Another excellent, but less obvious demonstration is also provided by Hermann Maier, who is captured here while negotiating a GS turn on a very steep course in Bormio, Italy. The last two frames of this sequence are of the most interest in terms of using the inside ski. The second frame (from the bottom) reflects a very dynamic completion of phase-II. Both skis are carving a part of an arc right in the fall line. The outside ski is obviously more loaded and is arched significantly. 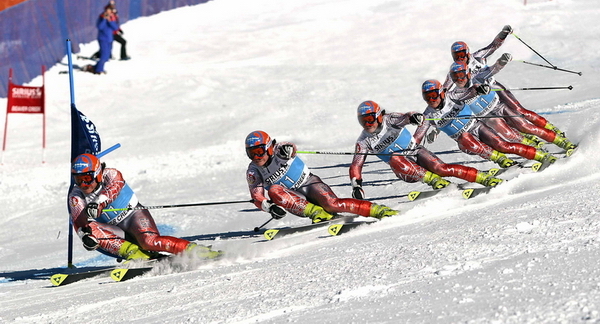 I have to say that there are not too many skiers even on the World Cup who can arc the ski so much in the fall line. Maier’s inside ski is also loaded in phase-II (second frame), but is carries much smaller load as it is bent noticeably less. I would say that the weight distribution ratio in this phase is somewhere near 70/ 30% in favor of the outside ski. On a pitch that steep the weight distribution ratio can be higher than usual and reach up to 80/ 20%. Notice that the pressure is applied to the middle of the outside ski in phase-II, while by beginning of phase-III (last frame) the pressure moves toward the tail of this ski. At the same time Maier maintains or increases the pressure on the tongue of his inside boot, which puts more pressure on the front of the inside ski. Thus, the weight does not simply shift from the outside ski onto the inside one. Rather it moves from the tail of the outside ski onto the front of the inside ski which is going almost straight at this point. The ratio in the middle part of phase-III (last frame) can be about 60 / 40%. The weight transfer will be completed by exiting phase — III. At this point, momentarily, the ratio will change to 40% / 60% in favor of the inside ski as can be seen from this shot of Maier. Therefore, by the beginning of phase-I of a «new» turn, the racer achieves a fully re-centered position over the front of the «new» outside ski. Of course, this is an ideal scenario, but it can not be achieved without complete understanding of intricacies of using the inside ski. I hope, that the illustrations provided here sufficiently prove that the use of the inside ski in modern race turns is different from just keeping both skis equally loaded. I suppose the important role played by the inside ski is clear. However, a clear approach to teaching the proper use of the inside ski is needed. I will offer my perspective on this, as well, by using just one basic drill as an example. One of the variations of this drill is its execution with placing the tip of the inside ski a little bit behind the tip of the outside one when the inside ski touches the snow. It allows one to avoid an excessive saggital split of the skis and the subsequent leaning onto the inside ski. Another variation of this drill is lifting the inside ski and keeping its tip over the tip of the outside ski (not to be confused with a javelin turn). When done correctly, it allows the skier to get more pressure on the shovel of the outside ski at the beginning of phase — I. In either one of these variations the tracks left on the snow should remain the same as the one shown above. Combining these variations of the drill with regular turns with both skis on the snow allows the skier to acquire a movement pattern for using the inside ski. At the advanced stages of development, these drills can be used in the gates, as well. I am convinced that understanding the role of the inside ski is necessary for coaches and racers of all levels. I hope this article has provided a little help.